From conception through production and packaging, all phases of manufacture at ITW Highland are engineered for high precision deep drawn parts. 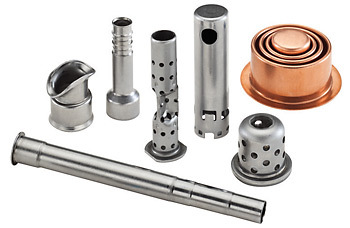 Deep drawn metal part prototyping is quick, in-house and done on production machines using standard processes. Since the methods and machinery are the same, the very same tooling can often be used for actual stamped metal production runs. on-time delivery and zero down time. The ITW Highland approach to production of deep drawn parts assures high throughput with virtually no downtime. Our comprehensive facilities and equipment include a range of capabilities for complete tooling, including CNC milling, turning and wire EDM. You get 100% in-house tool sets, for faster turnaround and greater internal control. We also maintain a KanBan system of redundant tooling and an aggressive preventive maintenance program, including tool changes at predetermined intervals. Lean Manufacturing practices incorporate complete manufacturing cells for all operations, from raw material through packaging. We continuously work to eliminate non-value-added operations. 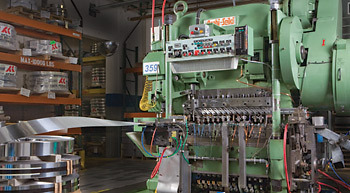 The plant is equipped with a wide range of progressive and transfer press capabilities. 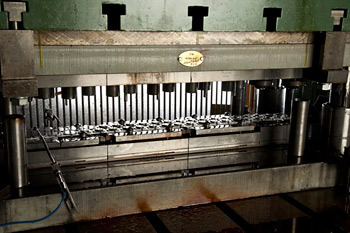 The progressive presses range from 15 to 100 ton, with up to 48 inch bed length and 12 inch stroke. Transfer press capabilities are from 5 ton to 225 ton, with a minimum of 16 station die sets, a maximum blank diameter of 10 inches and maximum draw length of 6 inches.